Discription:This makes an unusual and delicious lunch or brunch, or a great light supper. 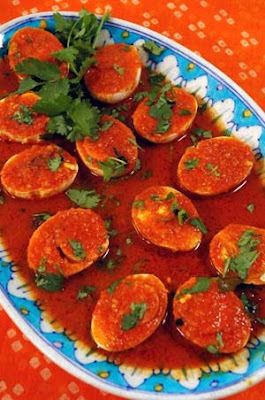 It’s even better when prepared a day ahead, so that the eggs have time to absorb the complex flavors of the sauce. Use canned tomatoes from Modena, Italy or Pomi brand tomatoes found in fine grocery stores—Their flavor is superb! Heat the oil in a heavy-bottomed saucepan set over medium-high heat until sizzling. Add the onions and cook until golden brown, adjusting the heat as needed to prevent burning. Add the ginger and cook for two minutes. Add the coriander, turmeric, chili powder, black cardamom pods, bay leaves, peppercorns, cloves, and cinnamon stick and cook for 30 seconds. Add half of the tomatoes to the mixture, stir well, and cook for one minute. Add the remaining tomato and the salt and cook for another minute. Pour in the water and stir to combine. Bring to a lively simmer, and then adjust the heat to medium-low. Cook for 15 minutes, stirring often to prevent sticking. Thin the sauce with more water if required. Adjust the seasonings. Pour half of the sauce on a deep-lipped platter, arrange the eggs, and cover with the remaining sauce. Decorate with the cilantro. NOTE: If you make this dish ahead, handle it carefully during storage to ensure that the eggs remain intact. Bring to room temperature, then heat in the microwave before serving. Heat a tspn of Oil in a pan. Add Red chilies and fry for a minute. Add Tomato pieces and saute for 3 to 4 minutes. Add Garlic, Curry leaves, Coriander leaves and Salt, then remove from heat. Let this mix cool for 5 minutes. Then grind this mix without adding water. Heat 1 or 2 tspn of Oil in a pan. Add Mustard seeds and Urad dal, Once it splutters add Curry leaves and ground chutney, fry this for 3 to 4 minutes. Remove from heat and serve this with 1/2 tspn of Oil on top. Discription:This is very easy to make.Try it!!! Cut Apple into small cubes. Boil water in a pan. Add Apple cubes and Cook for 15 minutes. Remove from heat and allow this to cool for 5 to 10 minutes. Drain the water and grind the cooked apple cubes in a blender nicely. Heat the ground apple mix in a pan. Add Sugar and Lemon juice to it. Keep the stove in medium heat. Stir this mix frequently to avoid spilling out and burning the bottom. Stir this mix till it becomes thick(like jam). This may take 20 to 25 minutes. Then remove from heat and let it cool completely. 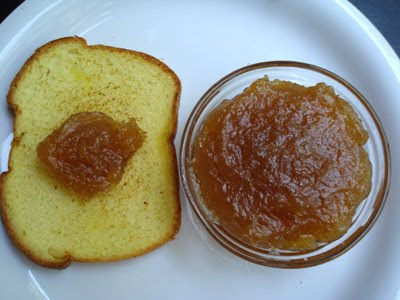 After that store the jam in sterilized jars and refrigerate. Discription:This is a perfect noodle salad to take to summer get-togethers instead of the same old boring potato salad. It's a great base to add your favorite vegetables to, or even some shredded chicken if you're a carnivore. 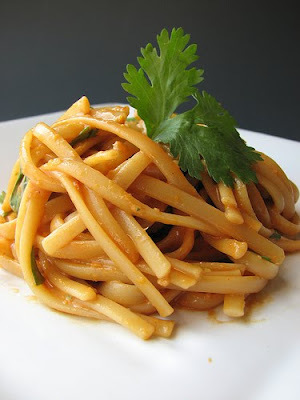 Cook noodles in well-salted water until al dente. Drain, rinse, and place in large bowl. In food processor, combine remaining ingredients. Pour over noodles and chill in the refridgerator for a bit. Discription:This is a fabulous dish, whether it's your main dish or your side dish. 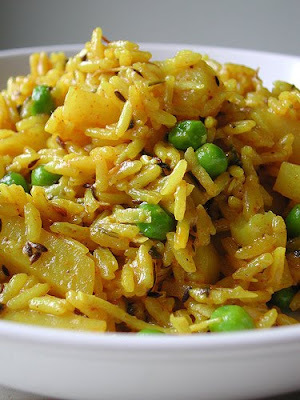 It combines two of my most favorite things to cook with, rice and potatoes, and is so amazingly spiced. Although the ingredient list seems long and fiddly, the entire recipe takes about 45 minutes from start to finish. Serve with fresh lime wedges, and enjoy the flavors. combine yogurt, cilantro, ginger, garlic, cayenne pepper, and coconut. Add potatoes, stir well, and allow to marinate for a few minutes. Heat oil in large pan, and add cloves, cinnamon stick, bay leaf, and cumin seeds. Cook for 1-2 minutes, until cumin turns brown. Add potato and yogurt mixture, and cook for 15 minutes, stirring occasionally. Once potatoes are nicely browned, add rice, and cook for another minute or two. Add turmeric, brown sugar, salt, lime juice, and water. Bring to a boil, cover with lid, and lower heat to a simmer. Cook, undisturbed, for 15 minutes. Add peas to pot, and do not stir in. Cover with lid and cook an additional 5 minutes. Remove lid, and fluff with fork. Remove from heat, and stir in butter. Serve and enjoy! On a half-sheet pan or large serving platter, spread out the black gram beans and kidney beans. Pick out foreign objects such as small pebbles and sticks. In a strainer, wash under cold running water for a few minutes or until the water runs clear. Place the black gram beans and red kidney beans in a heavy pan, preferably an enameled cast iron dutch oven. Add 4 cups of water and bring to a boil. Turn off the heat and let the beans soak while covered for about 2 hours. The soaking liquid will be used to cook the beans so do not drain and discard it. Add all of the ingredients for cooking the beans to the pot containing the soaking liquid and beans. Bring to a boil and reduce the heat to the lowest setting. Simmer with the lid slightly ajar for about 5 hours. If feasible, stir the beans gently every half hour. Take about 2 to 3 cups of the cooked beans from the pan and puree in a blender or food processor. Return the pureed beans to the pot. This gives dal makhani a smoother and creamier consistency. 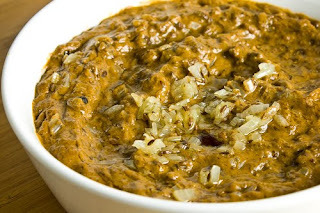 Keep the dal makhani simmering over low heat while you prepare the tarka (perfumed butter). Heat the ghee or oil over medium-high heat in a small skillet. When it is very hot, add the cumin seeds and cook until it turns dark brown, about 10 seconds. Add the onions and cook while stirring continuously until light brown, about 10 minutes. Pour the tarka over the warm cooked beans. Dal makhani with onion and cumin seed tarka. Top with the heavy cream and cilantro. Taste and adjust the seasoning if necessary. Serve warm with rice or bread. 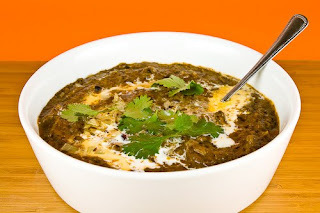 Dal makhani keeps in the refrigerator for up to 4 days and also freezes well. Defrost thoroughly before reheating over low heat. Boil the split Bengal gram and black gram in 3 cups water with black cardamom, turmeric powder, asafoetida, and salt. Heat the ghee in a wok (kadhai); add onions and garlic; fry till light brown. Add the remaining ingredients (except green coriander). Cook till the tomatoes turn soft. Add this to the split Bengal gram mixture. Serve hot, garnished with green coriander. Discription: spicy tomatos with garlic flavour. Curry leaves & Cilantro or coriander leaves. Powder the pepper, garlic and cumin seeds and keep aside. Pour oil in kadai, add the asefetoda powder and then the mustard and let it splatter. Now add the tomatos, add the turmeric powder, salt and saute for 2min and slightly mash it. Add little water and then add the tamarind and the made soup powder. Now add 2 cups of water and bring to one boil and switch off the flame. Garnish with Curry leaves and cilantro. Discription:This is very tasty and healty dish. Try it and enjoy! Grind the coconut and fennel seeds in to a fine paste. In the tamarind juice, add red chilly powder, turmeric powder, coriander powder, salt and the coconut paste. Mix well and keep aside. Drain the water and grind the soaked toor dal slightly. Add all the ingredients given for toorballs(paruppu urundai) and mix well. Make into balls and cook on steam. Heat oil in kadai, add the fenugreek seeds, wait till it turns light brown and splatter. Add the onions, garlic, curry leaves and saute till transparent. Add the tomato, saute for 2mins. Now add the already mixed tamarind juice and let it to boil. Adjust salt. Boil till the curry consistency is reached. Finally add the steamed balls and gingerly oil. Garnish with cilantro. Now the Toordal balls curry is ready !! Serve with hot rice !! 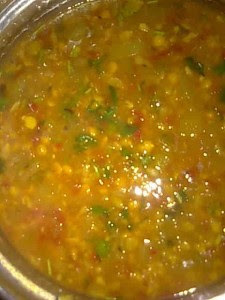 Discription:This plain Dal is simple,quick and teaty dish.You will surely enjoy it. Steam cook the toor dal adding the fenugreek seeds, few cumin seeds, turmeric powder, asefeotida, garlic, onions and tomatoes for 3 whistles(or till cooked). After done, mash them and keep aside. Heat oil in kadai, splutter the mustard and cumin seeds. Add the curry leaves and green chilly and saute a min. Now add the mashed dal. Add little water if needed. Adjust taste by adding salt and tamarind paste. Leave for a boil, and cook till needed curry consisitency. Tastes great with plain white rice with ghee, roti, chappati. Enjoy! This is Indian Sweet Mithai E-Book.By using this E-Book you can make sweets easily.